Chicken and vegetables are a standard dinner option, along with chicken and rice. But putting them all together in a casserole is something that’s not only fun and unique, but delightfully delicious too. I make casseroles all the time because they’re easy. All that’s really involved is chopping up the ingredients, adding some type of sauce and throwing it in the oven for 30 minutes or so. I’ve made casseroles with ham, chicken, vegetables and even pasta. Each one has its own flavor and always makes the family happy to sit down for dinner. So when Tyler Florence suggested a casserole that uses rice as its base, I knew it would be a winner. 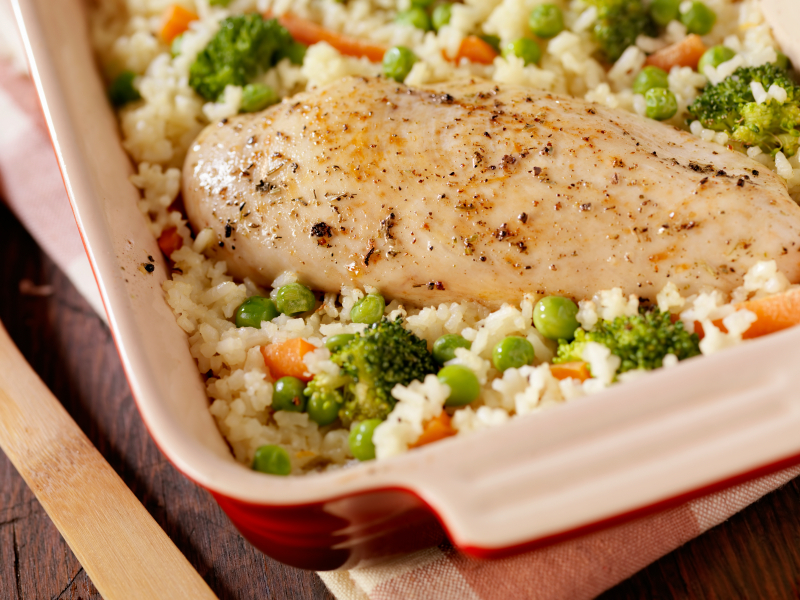 Since rice isn’t enough for dinner, this casserole also has chicken and a variety of vegetables. So, you still have all the necessary food groups to make a perfectly filling dinner that will bring smiles to every face at the table. Heat the olive oil in a medium roasting pan on the stove over medium-high heat. Sprinkle both sides of the chicken with salt and pepper, place in the pan and cook until browned, about seven minutes. Add the broccoli, carrots, onion and peas and cook for three to five minutes or until the vegetables are bright in color. Transfer the chicken and vegetables to a plate and set aside. Melt the butter in the same pan used to cook the chicken and vegetables. Stir in the rice and broth and bring to a boil. Place the chicken, vegetables and parsley back in the pan and transfer it to the oven. Bake for 30 – 40 minutes or until all the liquid is absorbed. Spoon onto plates and serve.